In the last newsletter, I asked my readers to let us know what basic astrology information they might want to read about in the newsletter. I’m happy to say we received quite a few responses. The one I’ve selected this week is about the lunar nodes, which are referred to as the north and south nodes. I selected this topic because in my classes I’ve noticed quite a bit of confusion for students, which can easily be clarified. So, let’s get started. The first thing to be aware of is that the lunar nodes are an axis, i.e., there are always two sides just like a seesaw. In Vedic astrology they are referred to as the Dragon’s head and the Dragon’s tail. What one must remember though is that both nodes co-exist, which means that one cannot understand one side without also understanding the other one. The north node in a person’s chart represents the area of life where one must make a conscious effort to work on and develop. It also is an area that the universe encourages us to evolve and grow in. The more we make efforts in this area, the more our life improves. The south node is the outlet for the efforts we make in the north node. It is NOT negative or something to avoid. It can’t be that or both nodes would be negative. By outlet I mean that this is where our efforts will be released. Thus, we don’t need to make efforts here. To do so would become problematic because it would mean we are not focused on working on the area we are asked to focus our efforts on, which is the north node. In other words, if we make efforts in the north node, the south node will take care of itself. We won’t have to do anything here because it will develop organically. It does seem to be true that whenever we are in the north node, things seem to work out for the best. In fact, I would encourage my readers to try an experiment. Once you’ve located your north node by sign and house, look for when the Moon is in that particular sign each month and see what happens. You may find that you will easily engage in the north node activities and that they will tend to work out positively. One astrologer made the prescient remark that “when one is in doubt about what to do, simply go to where the north node is in your chart.” I have found that it is self-reinforcing in that you will discover how beneficial it is to operate in the north node manner and will want to do that more and more. The greatest misunderstanding I’ve found is in the belief that one has mastered the south node in a previous life and now must develop the other side in this one. I would suggest that for one to master any aspect of life, it must cover both sides, not just one. For example, my north node is in Taurus and therefore my south node is in Scorpio. In no way do I feel I have mastered Scorpio. But, what I would say is that when I am operating from my north node, the Scorpio side tends to come out in a balanced and constructive way. Further, it becomes quite easy to do so. I’d like to share a little astrology secret. 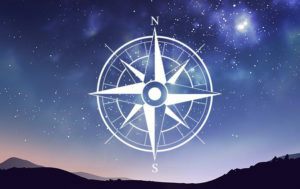 When you go to a psychic fair or get a 10-minute reading from an astrologer, a common technique is to simply talk about the north and south node. The astrologer doesn’t need a time of birth and they know that the client is very likely to be able to easily relate to the interpretation they give them. This is how important the north and south node are. I hope you’ll try the experiment I suggested above. Let us know what discover in the comments below. This was a lovely description which clarified much for me. Thanks so much for sharing your wisdom with us! Hi Jim.. I was taught 40 years ago, by my first astrology teacher, that the North and South Node, in the birth chart were considered karmic., and thus very controversial, as not every astrologer believed in reincarnation. I remember borrowing my teacher’s copy of Martin Schulman’s book , ‘Karmic Astrology, The Moon’s Nodes and Reincarnation.’ I have used it as a reference throughout these years of doing astrology charts, myself. Schulman’s explanation for me, North Node in Capricorn, South in Cancer, resonated. I was told that the well known 20th century astrologers, Grant Lewi, Alan Leo, Sid Omar, didn’t deal with the nodes, because of the connection, then, with reincarnation I recall, when we talked on one occasion, Jim, that I mentioned that my astrology teacher was a follower of Evangeline Adams. Miss Adams did not address the nodes, either, I was told. Throughout my practice, I’ve mentioned the nodes in readings, albeit, briefly. Your perspective on them is so interesting, so 21st century! 🙂 Thank you so much for addressing the nodes and opening me up, especially, to a new way of looking at them! I’m excited! Coincidentally, the first book I read on the nodes was the same Martin Schulman book you mentioned. It was a classic in its day and I agree with much of what he wrote. I don’t have an issue with those who believe in reincarnation. In fact, almost all of my students do and some of them have had direct experiences of past lives. What I presented is taken from Dane Rudhyar’s views on the nodes. His view neither validates or invalidates reincarnation. He simply observed that the north node represents the area of life where we benefit from putting in effort, where the south node represents the results of that effort. What I especially like is that both sides of the equation are neither good nor bad in themselves, but areas where we are asked to deal with in certain ways. Thank you for taking the time to express your experience of this controversial aspect in astrology.